Photographer Ed Gold interviewed soldiers who served in Afghanistan and asked them about their experiences of adjusting to civilian life. Soldiers Callum Wright, Scott Meenagh, Geoff Dunn, Dan Eccles and Terry Jones all served in the Parachute Regiment, known as the Paras. 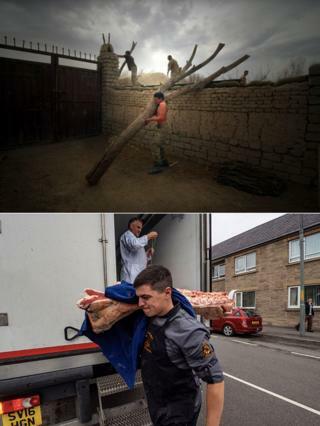 Ed worked with the Paras as a photojournalist in the UK and in Afghanistan, taking thousands of images of army life. 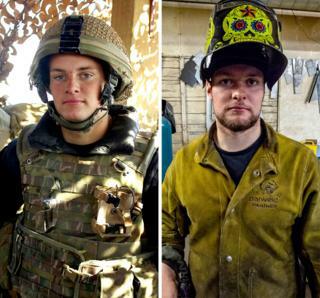 The photos shown here document the Para soldiers between July 2010 and July 2011 and when he caught up with them again in 2018 after they left the Army. 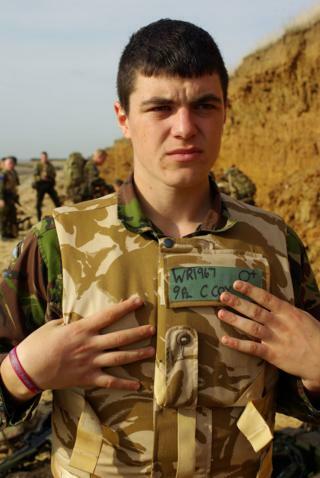 Callum Wright, 29, followed in the footsteps of three generations of his family and joined the Army, when he was 19. Initially, Callum wanted to be a tank transporter like his two older brothers but then decided he would rather be in the "nitty gritty" of combat and to push himself further. He chose the Parachute Regiment, despite the high failure rate. Out of 72 people in his intake group, he was one of only 10 who made it through to becoming part of the elite airborne infantry regiment. Callum did one tour of Afghanistan. But after returning to the UK, he felt restless in the Army. "When I got back, I got bored," he says. "It was the same mundane [work] day in, day out. "For me, when I knew the Afghan [tour] was coming up and when I was out there, I felt that I mattered and I was doing something that mattered. "But that feeling disappeared when we were back in the barracks." He became a personal trainer and also worked in a whisky distillery. But civilian life didn't suit Callum for long and, after 14 months, he returned to the Army, as a tank transporter. "That feeling, 'I have more to give,' came back, almost like a regret that I had left," he says. But after another two years in the Army, Callum had a change of heart again. "I was doing 17 hours a day and was tired all of the time," he says. 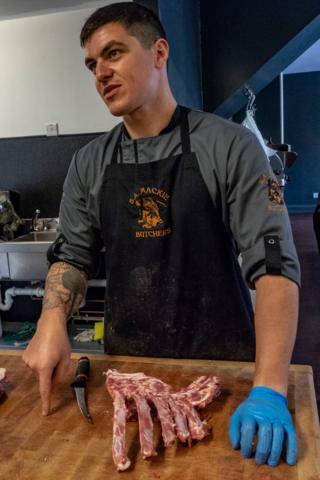 He became an apprentice at a butcher's. "I love it - and that's me." "I love working with my hands, like when you're taking all the meat off the bone, it [appeals to] the caveman in me." But Callum still remembers his Army days fondly. "I miss the blokes," he says, "everyone was going through the same, just close friends. The biggest thing I miss is the sense that you matter. "When you're in the Army, you wear a uniform and you are this presence - you are visibly serving. But when you leave, you don't matter. You are just the same as everyone else on the street." Now, Callum is making new plans again. He has started training to be a technician with the Scottish Ambulance Service. 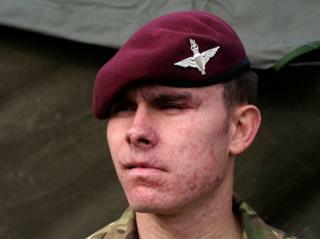 Scotty Meenagh, 28, had always wanted to belong to the Paras. "If you are part of the airborne, there is nobody else to look up to. You're the best soldier," he says. "They've been famous throughout history. I grew up being inspired by the Paras in the Falklands War. It was a unit that could complete impossible tasks that no other unit in the army could do at that time." 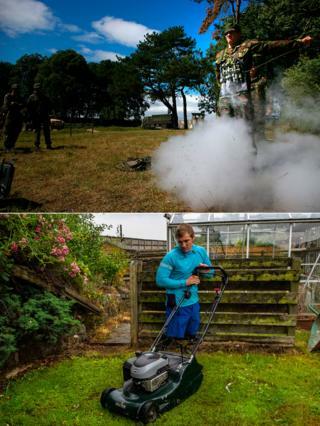 Scotty signed up to the military at 15, joining the Army Foundation College in Harrogate. However, 18 months into his training, he was injured and discharged. He rejoined at the age of 19 and started training at the Para Depot. 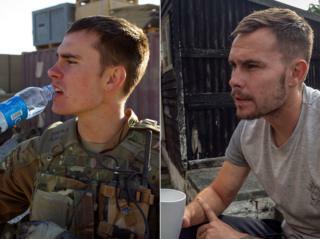 After 46 weeks of training, he qualified and did a tour of Afghanistan in 2010. Scotty was "Vallon man", which means he searched the route ahead of the patrol, including using a metal detector, to make sure it was safe. He was also a medic. "Your mates are relying on you to protect them," he says. "You're not focusing so much on the combat role, so my weapon would be slung over my back and I'd be relying on a soldier behind me for my protection." On 25 January 2011, Scotty was injured by a bomb that also killed one of his comrades. The injury meant that Scotty became a double amputee. Recalling his rehabilitation, he says: "You go through so many different states, it's hard to believe you were in that position - it's a strange start of coping mechanisms. "When you think back to such tough times, you remove the person from it." Scotty says he now puts all his energy into sport. "After being wounded, you need to try different things to rediscover your purpose. I found that sport enabled me to get out of bed every morning." 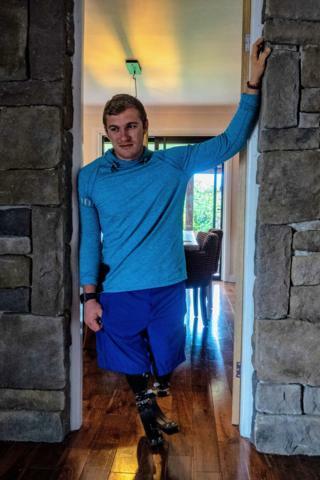 In 2014, Scotty turned his attention to cross-country skiing, after seeing it at the Paralympics in Sochi, in Russia. 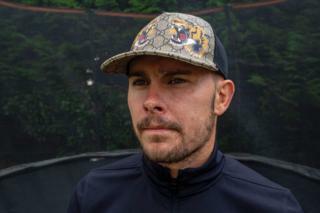 He went on to race on the FIS Alpine Ski World Cup circuit and, in 2018 in Pyeongchang, South Korea, became the first British sit-skier to race at the Paralympics. He is currently training for the 2022 Beijing Paralympics, and he's also about to get married and "make a family" for himself. "My fiancee and I have got a house and are living a nice normal life." Geoff Dunn's family tradition of serving in the military stretches back as far as the colonial wars of the 19th Century. Geoff, 48, joined the Paras when he was 17, believing them to be the pinnacle of the infantry. He went on tours in Northern Ireland and Africa. But after he got married, he felt he needed to choose between the military or his family, having seen a number of friends divorce. After leaving the Army, he took up a couple of civilian jobs before eventually settling in a role as a response officer with the police. Over time, he moved in to firearms policing. 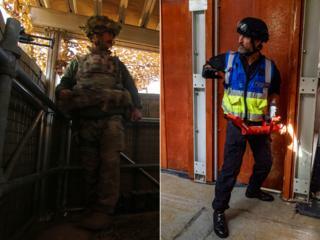 After 15 years in the police force, Geoff felt the call to once again "do his bit" in the Paras, motivated by the 2009 British operation in Afghanistan and the people he knew who had been killed or injured. "To be totally truthful, [I wanted] to test myself. It really did feel like a call to arms," he says. "It wasn't a light decision to go, as I had a wife and two teenage sons." He knew that after being out of the Paras for so long, he would have to start from the bottom again. Aged 40, Geoff passed the recruitment physical test. This included a 10-mile run carrying approximately 40lb (18kg) of kit, which he finished in less than two hours. He was quickly accepted back into the Paras. After a tour in Afghanistan, Geoff left the Army and eventually went into private protection, protecting maritime workers in the Indian Ocean. However, he says a family death made him reassess the amount of time he was spending away from home. He went to work for the Civil Nuclear Constabulary as a firearms instructor, among other duties. But after three years, a former boss asked him if he wanted to return to the police force. "I've always thought you have one life and that it is very limiting if you tie yourself to one thing," he says. "However, if you enjoy it, then get good at it." From a young age, Dan Eccles wanted a challenge. "I've always known about the Paras," the 26-year-old says. "I had a little recruitment book that inspired me. I was hooked and wanted a slice of it." At 17, Dan went to the Catterick Para Depot. It was the hardest thing he's ever done, he says, physically and mentally. 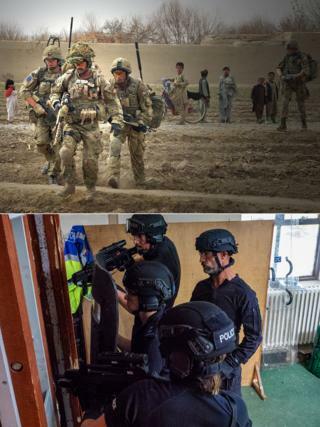 After passing his training, he went to Afghanistan. Serving there was the reason he had signed up, he says. But Dan found that returning to the UK and settling into civilian life outside of the Army was not so straightforward. "When you come back, it's hard to adjust," he says. "You spend six or seven months fully switched on and you're always looking at every single person, [thinking] 'What are they doing? Are they carrying weapons? Who are they speaking to? "So when you come back, it's very confusing. You can't switch your brain off. I didn't really get that much help. I struggled for a few years." 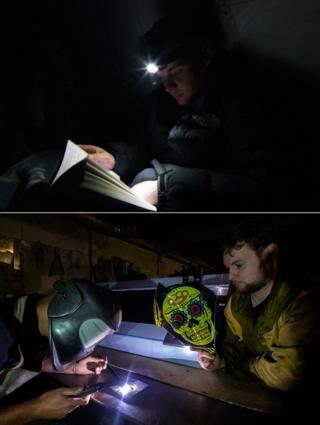 Dan took a welding course, funding it himself by working in a retail stockroom. But three years in he became depressed. "I missed the excitement [of the Army]. Being in the stock room was very mundane." But his perseverance paid off, with his training leading to a welding job, making metal appliances for kitchens in restaurants, cafes and hotels. Dan's other passion in civilian life has been powerlifting, a hobby he started before he left the Army. "I was so short and skinny and tiny," he says. "I wasn't interested in looking ripped. I just wanted to eat a lot of food and get very strong." Terry Jones, 29, joined the Army to get out of his local Welsh town. He enrolled in the Paras when he was 17. He served for nearly 10 years and completed two Afghan tours, including the tour known as Herrick 8 in 2008. He says of this tour: "It was horrendous. It had the worst death rate since World War Two for the Paras." On his second Afghan tour, in 2011, Terry was hurt trying to help his injured comrade Scott. He sustained a head injury and was put into an induced coma for 10 days. He lost 70% of the vision in his left eye and was medically discharged in 2014. "I miss the lads, the banter and how close you are down there," he says. "You look out for each together. Everybody has got each other's back." After leaving the Paras, Terry worked as a lorry driver and then in a furniture shop. He later became the owner a PVC plastics company that made items such as bouncy castles - but since leaving the business, he has focused on looking after his family. "Right now is the happiest I've ever been," he says. "I spend a lot of time with my kids, on bike rides and taking them on holiday." Photos and interviews by Ed Gold.